Ebisu Yokocho is a restaurant alley packed with 1950’s-retro izakaya. 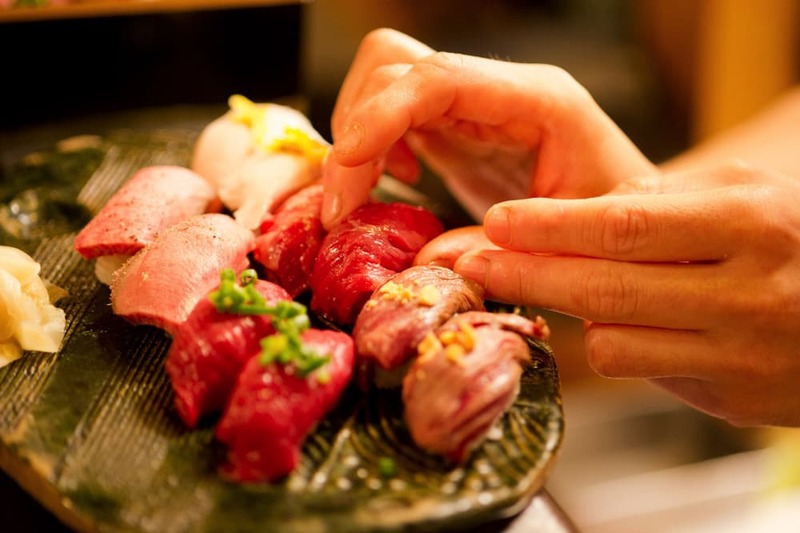 In this article, we’ll spotlight “Nikuzushi” — an unique izakaya serving meat sushi located in Ebisu Yokocho. If you’d like to read about other izakayas in Ebisu Yokocho, check >>Recommended Izakayas / Bars: Feast on Delicacies at Ebisu Yokocho! “Kato Shoten Nikuzushi” is an izakaya located in Ebisu Yokocho that specializes in meat sushi. The izakaya is compact with only 38 seats including the bar counter, but the intimacy adds to the homely ambiance. While sushi is typically associated with seafood, “Nikuzushi” pairs sushi with Sakuraniku-brand horse meat and wagyu beef. For those unaccustomed to horse meat, it’s generally low fat, flavorful, and has good texture. The izakaya has an English menu and English-speaking staff. Izakayas specializing in raw meat are a rarity even in Japan, so take advantage of this opportunity. If you’re at Nikuzushi, horse meat sushi is a must. Horse meat may not be a popular food overseas, but it’s fairly common in Japan, especially served sashimi-style. Horse meat is generally lean, but Nikuzushi also serves “sashitoro”, which is a fattier cut similar to wagyu. Like wagyu, sashitoro melts in your mouth and, since it’s seared before serving, it’s a good option for those that are wary of raw meat. For drinks, Nikuzushi serves the whole gamut from izakaya staples like sake and beer to liquors that pair with meat like red wine. Experiment with liquor pairings and find your own match for raw meat sushi! Ebisu Yokocho is an alley packed with casual diners that took over the former Yamashita Shopping Center. The alley is brimming with small diners, each only measuring about 9 square meters, and the charming, retro ambiance is reminiscent of 1950’s era Japan. Ebisu Yokocho only gathered unique owners and the air is filled with energy. 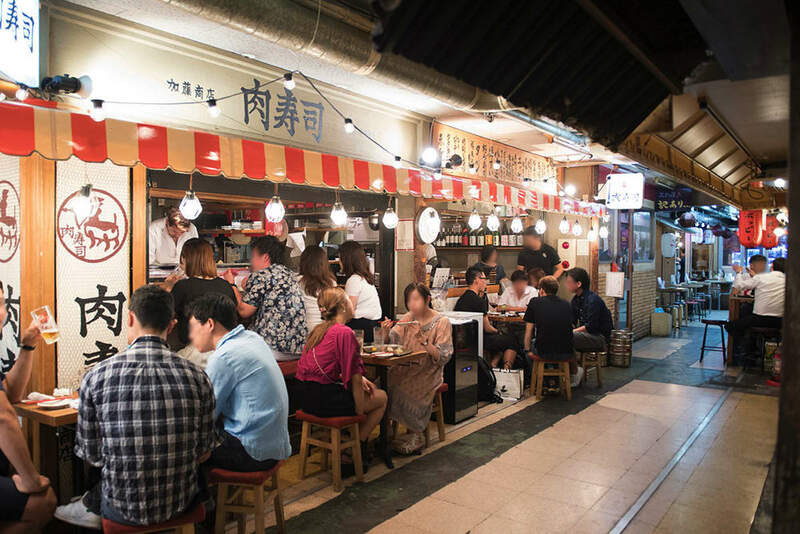 Thanks to a roof, visitors can saunter through Ebisu Yokocho on rainy days and line stomachs with local, delicious izakaya food. Interested in bar hopping? 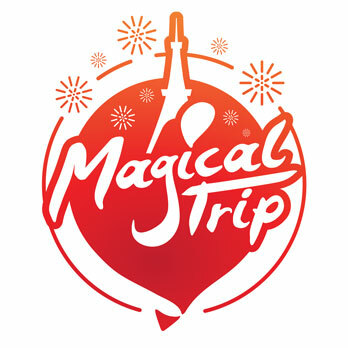 We recommend a guided Tokyo Bar Hopping Nightlife Tour in Shinjuku. 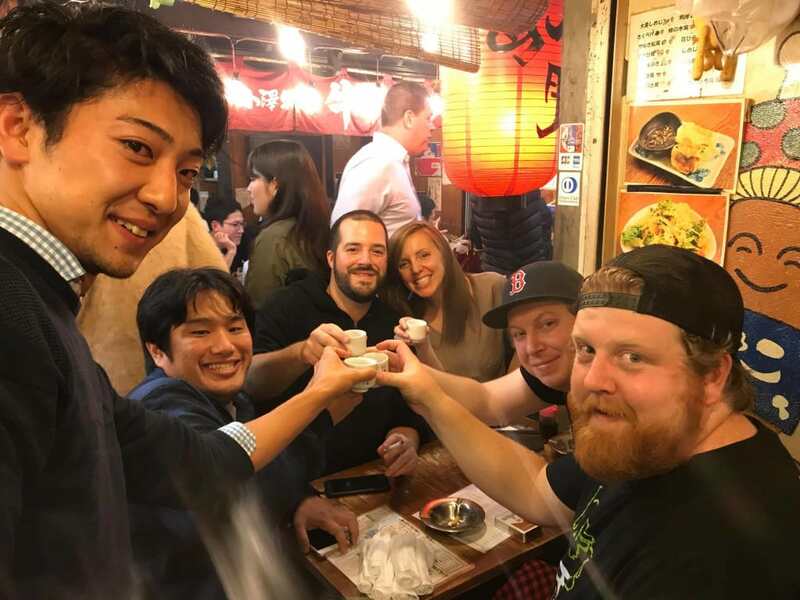 It only costs $70, inclusive of food and drinks, and a local, English-speaking guide will lead you to all the secret izakaya spots in Shinjuku during the 3-4 hour tour.